My daily meditation practice involves a 30-40 minute meditation every morning and for the longest time, I have used a timer on my iPhone to make sure that I sat still for the desired time. I like to keep my eyes closed during meditation, so checking my watch is problematic and, up until recently, I wasn’t aware of any other way to track my time. Then I was reading Russell Simmons’s book Super Rich (a very good book on service, business success, yoga, meditation and eating vegan) in which he talks about transcendental meditation, a practice in which you recite a mantra a certain number of times using meditation beads to keep track. 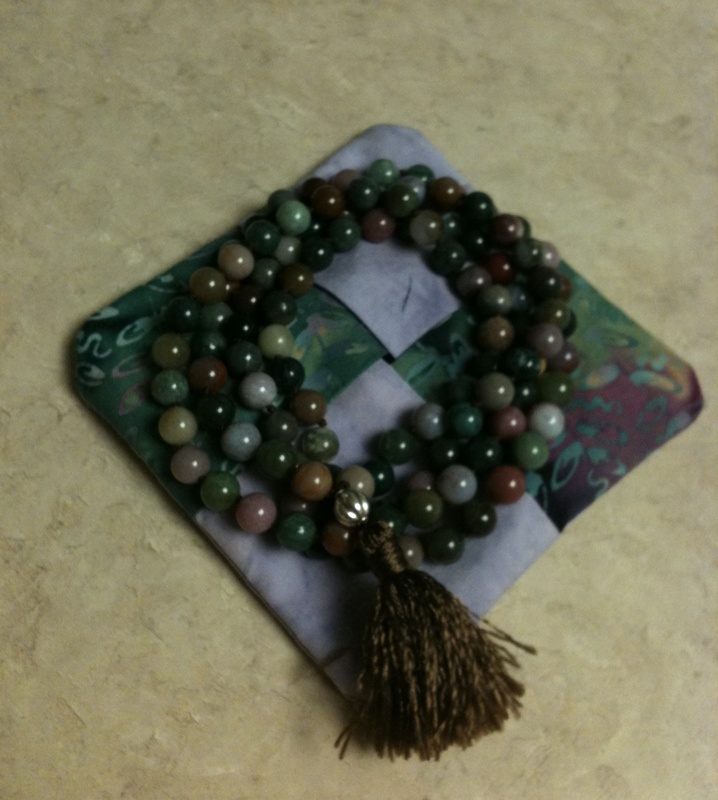 I guess I must have mentioned this to my wife as a week later on my birthday I was pleasantly surprised to receive a gorgeous set of Agate Buddhist Prayer Beads. Mala beads, as they are also known, are typically used by Buddhists and Hindus, usually made from 108 beads, though other numbers are sometimes used. The picture above shows the beads my lovely wife gave me. The concept works like this: holding the Mala beads in both hands, you move each bead from one hand to the other each time you recite your mantra once. Depending on the length of your mantra, it could take a few or many minutes for all 108 beads to travel from the right to the left hand. Buddhist traditionally repeat their mantras hundreds or even thousands of times and use grains of rice from one bowl to another to track the number of times they have gone through all the beads. For my meditations, I like to cycle through the beads twice and if I need a shorter meditation I cycle them just once. Ever since receiving the beads, I have used them as my timer, but they also help keep my mind centered on my meditation. They are wonderful and are now a key piece of my daily mediation. Whether you use the beads to track your meditation mantras or simply track time by counting your breaths they will can certainly enhance your meditation experience.